FOOTBALL: TWO out and one in, that’s the deadline day result for Coventry City as Mark Robins concluded his January transfer window business. 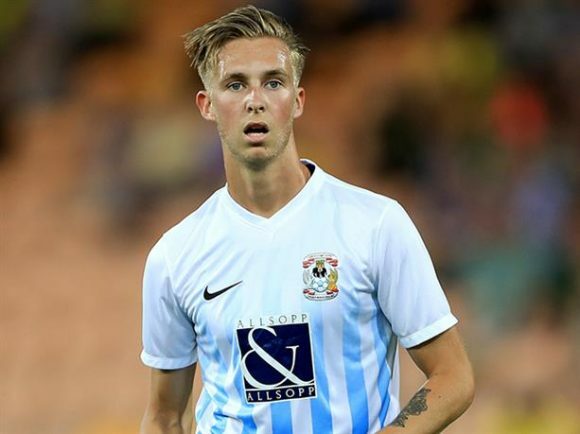 The club ‘reluctantly’ accepted an offer from Wolverhampton Wanderers for 20-year-old Ben Stevenson before it was announced former Sky Blues player Jonson Clarke-Harris will link up with Robins’ men on a loan deal from Rotherham United. It is hoped Clarke-Harris, who is a product of the Coventry City Academy, will sign a full time deal at the club once his loan expires. And this morning the club confirmed that striker Kwame Thomas has joined Solihull Moors after spending one-and-a-half years with Coventry City, during which he made 15 appearances and scored three goals. ACADEMY graduate Ben Stevenson is following in the footsteps of former team mate James Maddison after agreeing to join Wolverhampton Wanderers for an undisclosed fee. Stevenson was part of Coventry City’s 2017 Checkatrade Trophy winning team and made 48 apprarances for the club, scoring three goals. The midfielder will immediately join Colchester United on loan until the end of the season to continue his development. Speaking to Wanderers’ official club website, Stevenson said he is happy to be joining a massive club with big aspirations. He added: “As soon as I knew of the interest I wanted to jump at the chance of joining such a big club. “I’ve been at Coventry since I was eight, it’s the only club I’ve ever been at so it’s got a big place in my heart and I’ll always thank them for everything they did for me. Stevenson will be working with Wolves’ Under 23s team. STRIKER Jonson Clarke-Harris has joined Coventry City on a loan deal until the end of the season. The 23-year-old joins the Sky Blues from Rotherham United and eyes a permanent transfer once his current contract at the Millers ends this season. A product of the Coventry City academy, Clarke-Harris remains the youngest player to have played for the senior team – at 16 years and 21 days. A prolific goalscorer in the Under 18s squad, Clarke-Harris has since played for Peterborough, Southend (Loan), Bury (Loan) and Oldham, before joining Rotherham in 2014. While there, the forward has enjoyed loan spells at MK Dons and Doncaster. Mark Robins said: “We’re delighted to get the deal over the line to add Jonson to the squad. “He is a strong, powerful, athletic striker who adds further threat and presence to our attacking line-up. KWAME Thomas’ contract at Coventry City has been cancelled by mutual consent. The 22-year-old, who joined the Sky Blues in summer 2016, linked up with National League side Solihull Moors in November. Since joining the Moors, Thomas has made 15 appearances and scored two goals.